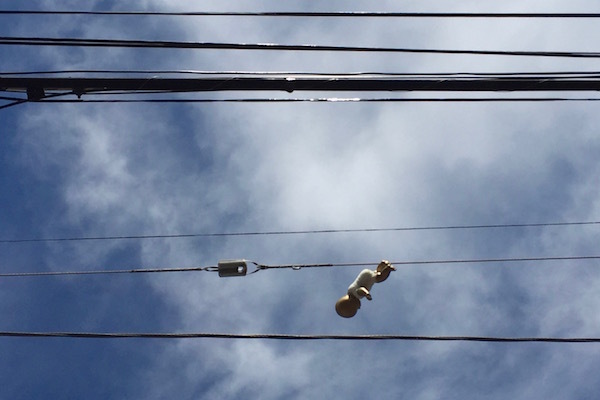 The vigilant blogger must learn to look for inspiration anywhere and everywhere. These stories don’t grow on trees! [Well, actually they might grow on trees.] 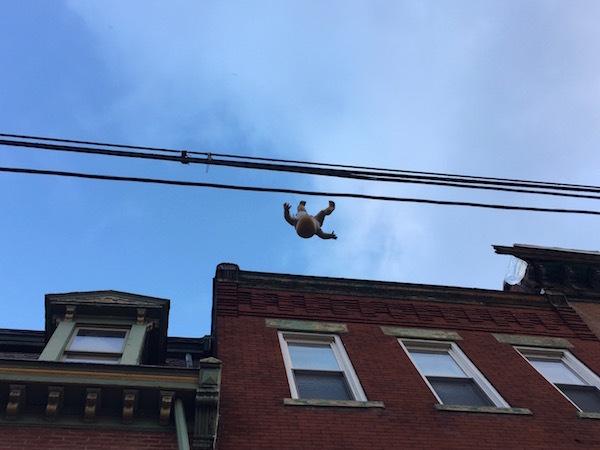 Maybe Mayor Peduto has enough clout to order the D.P.W. 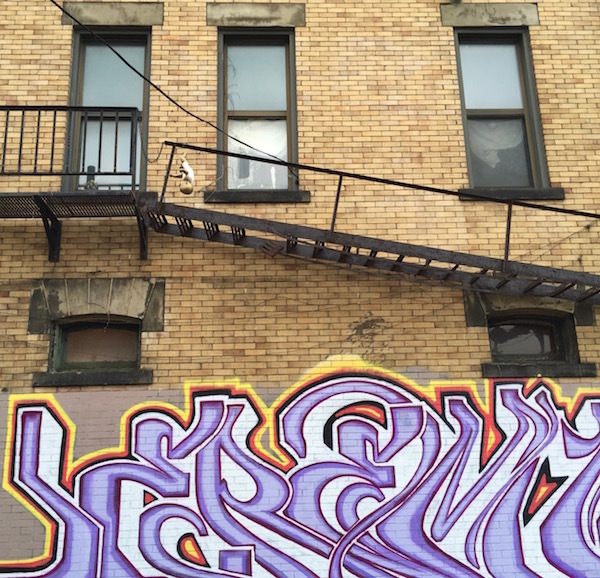 into creating brilliant street art, but The Orbit has yet to wield that kind of influence. Until then, we’re at the mercy of fate, jonesing for goofballs, and always on the lookout for the next score. 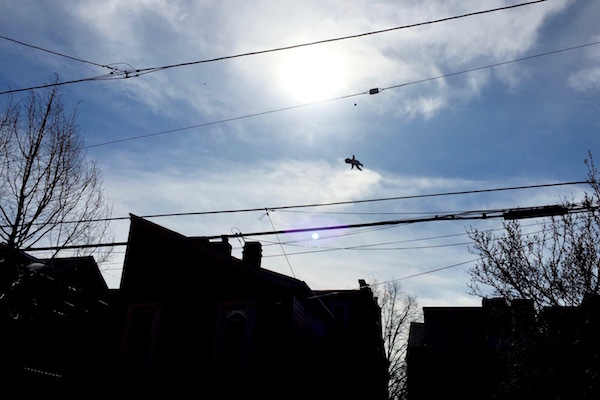 And indeed it was fate–an extra cold morning (too cold for the bicycle), a missed bus, a re-routed walk to work–that led this blogger to receive what we’re considering a kind of divine inspiration. 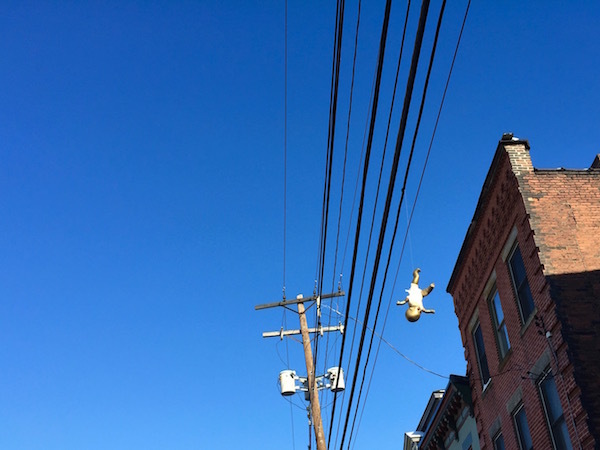 Yes, at the moment when we needed it most–mere hours (err…a couple days) before deadline–today’s story literally fell out of the sky at us in the form of one suspended baby doll, dangling by his right foot from the telephone wires along Penn Avenue. 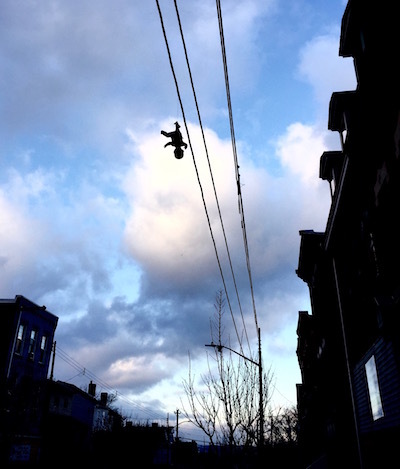 We’ve seen a lot of things hanging from wires in our day–banners and debris, vines and living creatures, and of course the ubiquitous pairs of sneakers–laced, eulogized, and interred in the sky as a final loving tribute. 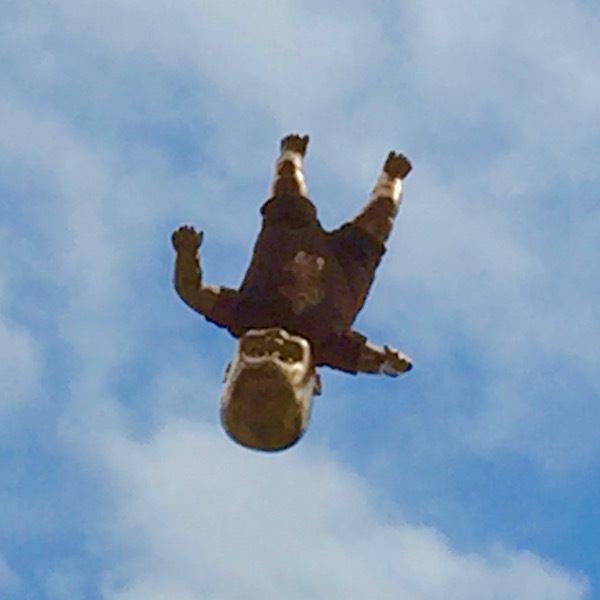 But until now, Pittsburgh Orbit has never encountered a dangling (falling? 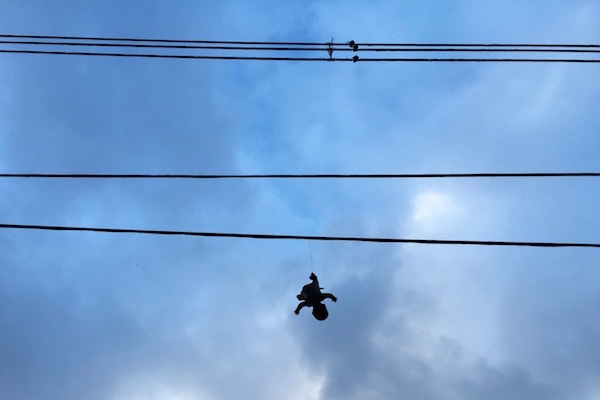 flying?) 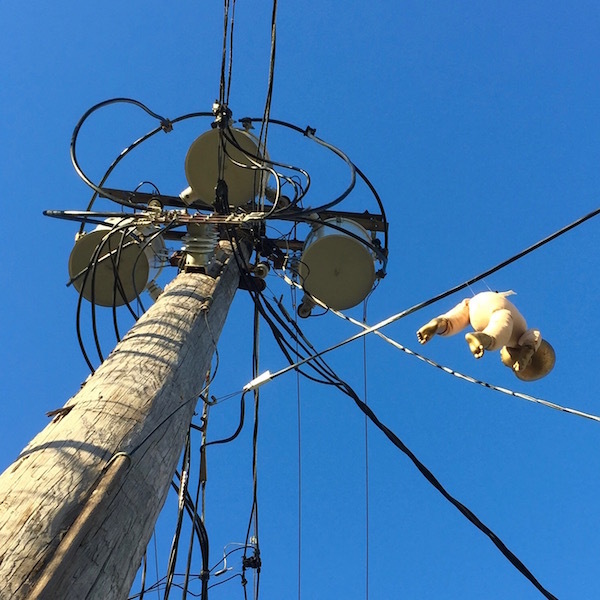 baby doll high in the utility infrastructure. This one is new to us. 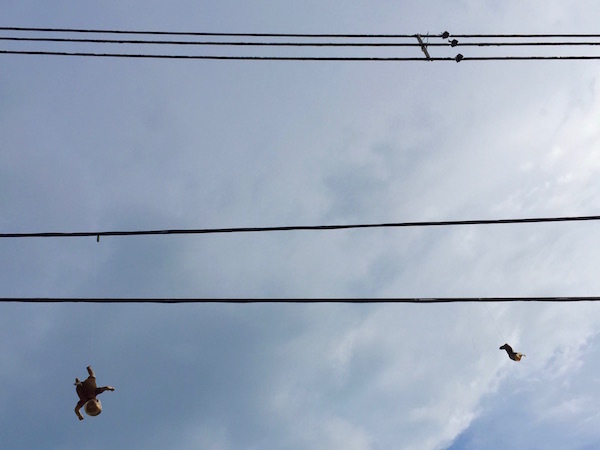 Though not parents ourselves*, hanging the next generation from telephone wires may be understandable–hell, there might still be time to string up the Millennials! In any case, it’s a questionable form of child care for a newborn and likely not recommended by “real” parents. 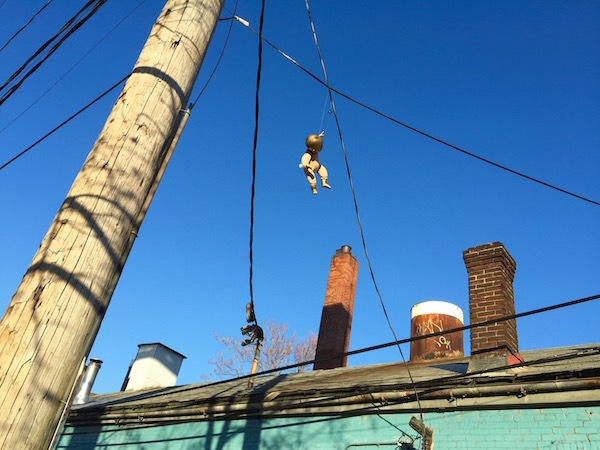 How the baby doll got up on those wires is a mystery. 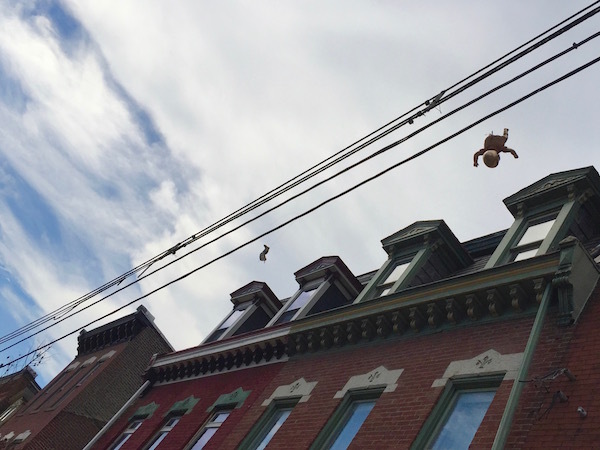 Getting a laced pair of sneakers up there seems like a simple enough task–you stand on the sidewalk and keep throwing them over head until they catch. 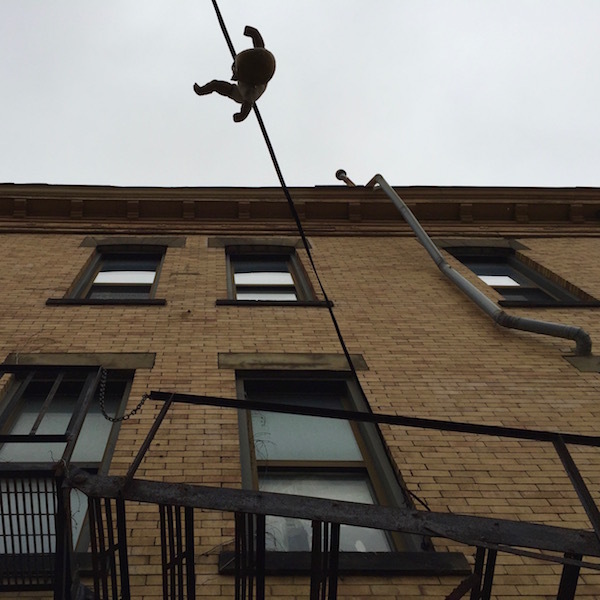 But this baby doesn’t have any counter-balance, no obvious hook to snare the electric line on the trip up. 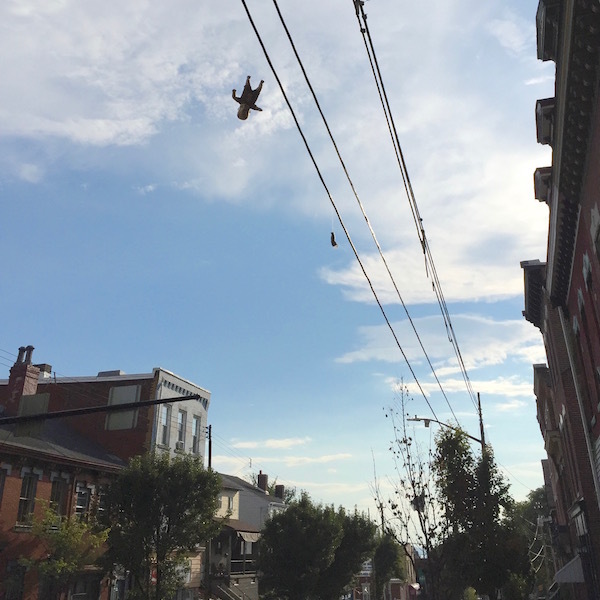 That, and these wires are a good twenty feet in the air and not terribly near any windows on the Penn Ave. buildings. How did it get here? There is one more interesting tidbit. Though it is not at all apparent in these backlit morning light photographs, the baby has had its flesh painted gold (you’ll have to take The Orbit‘s word for this–or better yet, go see for yourself). 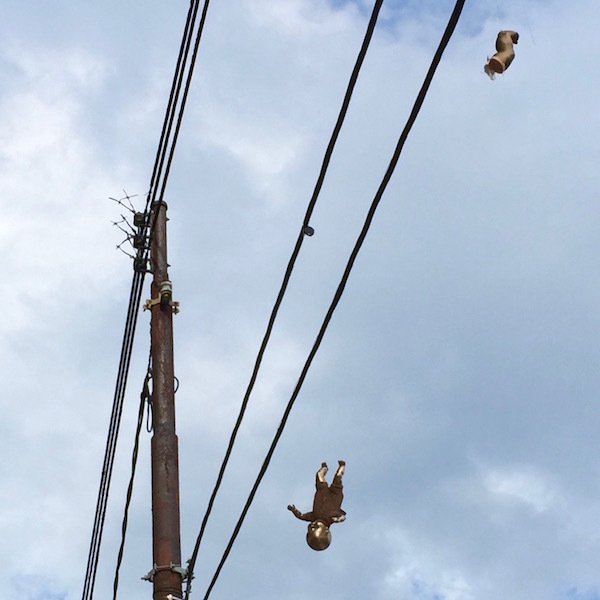 This should allay any possible suspicions that the baby reached the overhead wires of natural causes. Uh-uh. Not buying it. This card-carrying amateur detective wanna-be knows the work of someone on the prankster-street art continuum when he’s standing under it…and he likes what he sees. 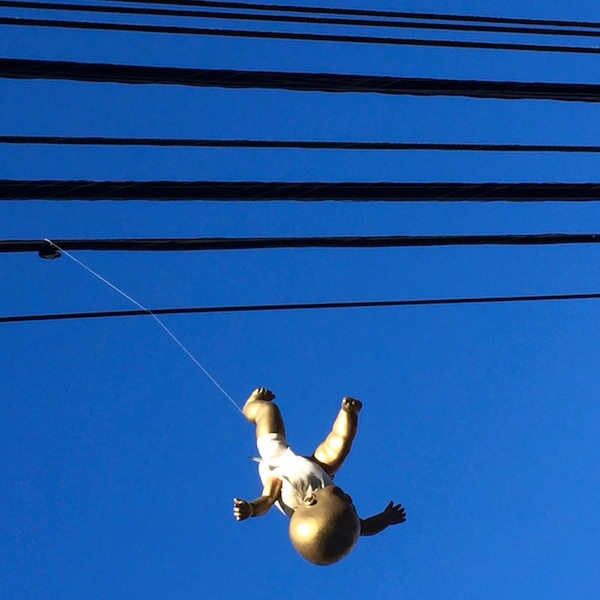 To you, Golden Baby Dangler (whoever you are), thank you for making one blogger’s day.